Niles offers an in-wall soundbar with its Cynema Soundfield system. A departure from traditional soundbars, the Cynema Soundfield features an in-wall mounting system that allows it to be centered under flat-panel displays without cutting or drilling wall studs. • Explore reviews in our In-Wall and On-wall Speaker Review section. • See related reviews in our Soundbar Review section. The Cynema Soundfield system is available in three active models and one passive model in lengths of 48, 55, and 65 inches. 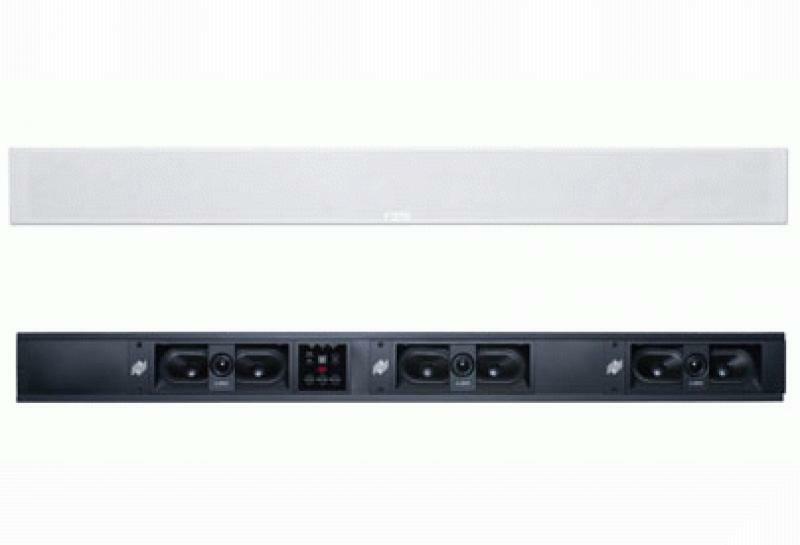 The in-wall soundbar consists of left, right, and center self-contained speaker modules and includes a preamp/amplifier module for the powered models. Powered models also include a separate low voltage power supply -- easily mounted in a stud bay adjacent to a wall outlet or behind the display -- to eliminate the need for high-voltage wiring in the wall. Cynema Soundfield's speaker and amplifier modules snap in from the front into rails mounted on the wall's studs, and can be adjusted between the studs as needed to achieve the best soundfield. Installers can configure the mounting positions of each speaker module and the amplifier around existing studs. The speaker and amplifier modules have small foldable L-shaped brackets on each side to enable the installer to temporarily hang the modules on the in-wall mounting system's rails, freeing up both hands and making the speaker and amplifier connection terminals easy to see and connect. Wiring is run through specially designed spaces in the mounting system to eliminate the need to drill holes in the studs. Included spacers can be inserted to cover any empty areas between modules for a clean installation. A low-profile, magnetically attached, and paintable MicroPerf grille makes the entire assembly virtually invisible to end users for a clean look. Included with the CSF-65A, CSF-55A, and CSF-48A amplified models is a 3-channel by 30 W digital preamp/amplifier with Dolby Digital processing. The preamp/amplifier module can be operated via IR for simple integration and auto-senses audio input to function as a seamless extension of the TV's remote control. The passive CSF-48P does not include an amplifier module, allowing integrators to utilize any form of amplification. The Cynema Soundfield passive model contains three speaker modules, one in-wall mounting system with grille, and one cutout template for the in-wall mounting system. The three powered models contain one preamp/amplifier module, one in-wall power supply unit with AC power cord, one cutout template for the in-wall power supply box, one Niles SW-T bracket for mounting an optional Niles SW-T wireless subwoofer transmitter, one TOSLINK optical cable 3m, one stereo 3.5mm to dual RCA cable, one DC power cable for the optional wireless transmitter 1.5m, and three speaker wires for the left, center, and right speaker modules. The Cynema Soundfield system is now shipping at an MSRP of $1,195.95 for the CSF-48P, $1,599.95 for the CSF-48A, $1,749.95 for the CSF-55A, and $1,999.95 for the CSF-65A.